A clean and well-maintained drum kit is the first sign of a serious and dedicated drummer. While it doesn’t need daily cleaning, it is highly recommendable to clean it in regular intervals. This goes twice for the cymbals, as their tone and performance depend heavily on the care they receive. In this article, we’ll take a look at some of the best cymbal cleaners. Here are my favorite cymbal cleaning solutions. If your babies need some care, grab one of these. 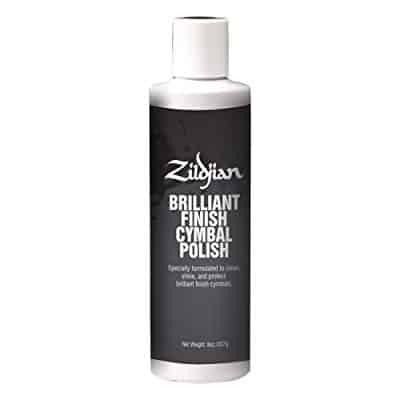 The first item on the list is the Brilliant Finish Cymbal Polish from Zildjian. It is a formula made for the drummers who use brilliant cymbals. 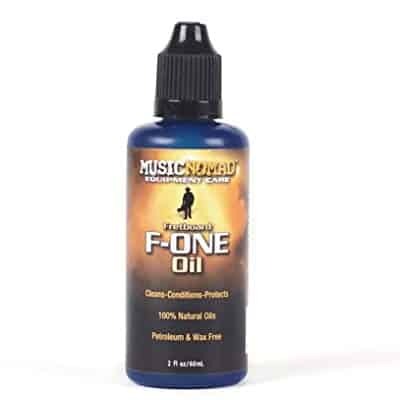 The Brilliant Finish is recommended for both professional and casual musicians. While some cymbal cleaners come in liquid form, the Brilliant Finish Cymbal Polish is a cream formula. It is on the stronger side, and while it does a great job of cleaning grime and fingerprints off the cymbals, it can potentially damage the logos. This formula is only to be used on brilliant cymbals. It is not recommended for use on cymbals with traditional finish, the ones made of ZXT titanium, or Kerope cymbals. Apply the cream onto a cloth or paper towel and rub it onto the cymbal. Wait ten to fifteen seconds for it to dry. Make sure to skip the logos, as the formula might damage them. After it’s dried, use a clean cloth or paper towel to remove the remaining cream from the cymbal. The next item on the list is the MN112 Premium Drum and Cymbal Care System from Music Nomad. This is an affordable two-in one kit made for players who like to keep the entire drum set shiny and clean. The MN112 Care System contains two separate liquid solutions – Cymbal Cleaner and Drum Detailer. While the Cymbal Cleaner is made for cymbals only, the Drum Detailer is an overall polisher and can be used on all metal and wooden parts of the kit. The Cymbal Cleaner formula is both acid and silicone-free so it is safe to use on all cymbals. It is strong, so be careful not to clean the logos off your cymbals along with the dirt and grime. Sprinkle the formula onto a clean cloth and apply it on the cymbal. Leave it to dry for a couple of minutes. Take another clean cloth and wipe the formula off the cymbal. Depending on the state your cymbal is in, you might want to repeat the process once or twice. Paiste is one of the most renowned cymbal manufacturers, popular among pros and amateurs alike. Their Cymbal Cleaner is very popular, and easily one of the best cymbal cleaners. 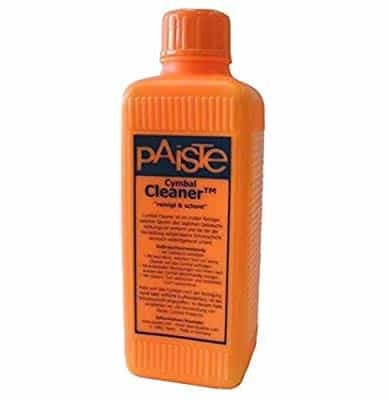 The Paiste Cymbal Cleaner is a mild paste for all-around use. It comes in a 6.5oz bottle. You won’t get the cleaning cloth with this one. This is a general-use formula made for all types of cymbals, regardless of the material and the type of finish. It is equally at home on old and new cymbals by all major brands. Apply some paste onto a clean cloth/paper towel or directly onto the cymbal and distribute it around. Like with the majority of other cleaners, make sure to skip the logos. Let it sit for a couple of minutes. Take another clean cloth and wipe the paste off the cymbal. If needed, repeat the process. Jim Dunlop is one of the biggest manufacturers of guitar, bass, and drum accessories. Their world-famous System 65 cleaners are among the most popular drum and cymbal care products on the market. 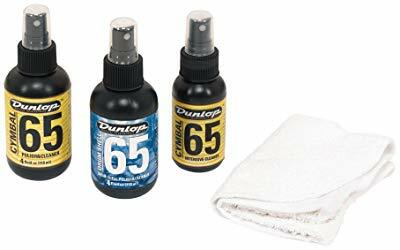 Dunlop’s System 65 Kit comes in a set of three solutions – 65 Cymbal Cleaner (4oz bottle), 65 Cymbal Intensive Care (2oz bottle), and 65 Drum Shell Polish and Cleaner (4oz bottle). A microfiber cloth rounds off the package. The 65 Cymbal Cleaner is there for regular maintenance duties, while the 65 Cymbal Intensive Care is there for the toughest jobs. Both are made for general use on all types of cymbals. The 65 Drum Shell Polish and Cleaner takes care of the rest of the drum kit. Pour some Cymbal Cleaner or Cymbal Intensive Care formula onto a clean cloth and apply it onto a cymbal. Both of them are strong, so be careful around the logos. Let the cymbal dry for a couple of minutes. Take another clean cloth and wipe the formula off the cymbal. Repeat as needed. The MP03 Cymbal Polish is a popular Lizard Spit cymbal care product that numerous pros and amateurs rely on to keep their cymbals shining. The MP03 comes in a 4oz plastic bottle. The liquid is green and pleasant smelling. There are no additional products or cleaning cloths included with this polisher. Lizard Spit’s MP03 is made especially for raw metal cymbals. If your cymbals have brilliant finish, it might be good to look for another cleaner. It is a strong formula that combines cleaning and polishing in one. Take a clean cloth, pour some MP03 on it, and apply it onto the cymbal. Let the cymbal dry for a minute or two. Take another clean cloth and wipe the polisher off the cymbal. In case your cymbal is in a really bad shape, you might need to repeat the process. Depending on their quantity and conditions, cleaning your cymbals might take anywhere from fifteen minutes to several hours. It is, therefore, important to arm yourself with the proper tools for the job. 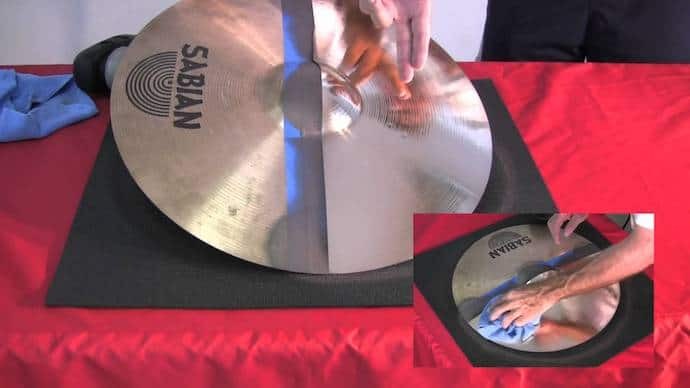 In the guide below, we’ll take a look at how to choose the right cymbal cleaner and how to properly care for your cymbals. The first thing you’ll need to consider is the type of cymbals you have on your kit. In terms of finish, there are two main types – raw metal and brilliant. They require different types of cleaners and using the wrong type might damage your cymbals. Always read the label on the cleaner and make sure you’re buying the right type. Cymbal cleaners are for the most part just that, cleaners. Some of them, however, double as polishers. The combined cleaner/polisher products tend to be a bit more expensive to reflect their double role. If you opt for a straight-up cleaner, it might be wise to also invest in a polisher, as the best cymbal polishers give the cymbals a protective coating which can significantly lengthen their lifespan. While the basic cleaning process is largely similar across the board, specific brands will require you to use specific products and clean your cymbals in a certain way. To make sure you are doing the right thing, check the manufacturer’s site for a thorough explanation. When it comes to keeping your cymbals in good shape, cymbal cleaners are a must. Well-maintained cymbals can help you immensely in both your daily drumming and in the recording studio. 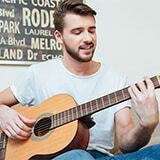 Regular care will also increase their life and improve your tone. Very nice reviews of cymbal cleaners. Love your concept. Every drummer should have these cymbals cleaners. Because if you can not use cymbals cleaners then our drum cymbals do not produce good sound. For a better sound, cleaning the cymbals is very important.